Reading and share top 7 famous quotes and sayings about Blessings From God by famous authors and people. Browse top 7 famous quotes and sayings about Blessings From God by most favorite authors. 1. "Satan cannot win. Why not? Because he has denied God's sovereignty and disobeyed God's law. But Moses was told explicitly, God's blessings come only from obedience. Satan will not win because he has abandoned God's tool of dominion, biblical law." 2. "Sadly, prosperity is not the only reason people forget God. It can also be hard to remember Him when our lives go badly. When we struggle, as so many do, in grinding poverty or when our enemies prevail against us or when sickness is not healed, the enemy of our souls can send his evil message that there is no God or that if He exists He does not care about us. Then it can be hard for the Holy Ghost to bring to our remembrance the lifetime of blessings the Lord has given us from our infancy and in the midst of our distress.There is a simple cure for the terrible malady of forgetting God, His blessings, and His messages to us. Jesus Christ promised it to His disciples when He was about to be crucified, resurrected, and then taken away from them to ascend in glory to His Father. They were concerned to know how they would be able to endure when He was no longer with them.Here is the promise. It was fulfilled for them then. It can be fulfilled for all of us now." 3. "True religion is when you serve God to get nothing else but more of God. Many people use religion as a way of getting something else from God they want-blessings, rewards, even escape from judgement. This is wearisome to us, and to God. 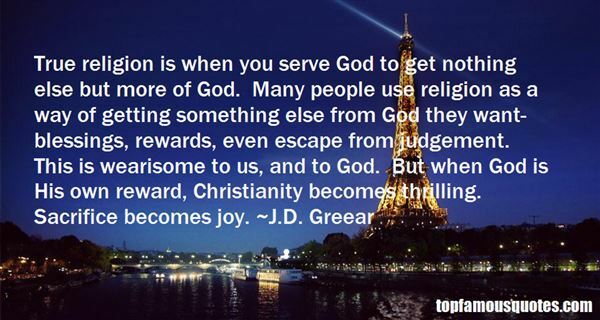 But when God is His own reward, Christianity becomes thrilling. Sacrifice becomes joy." 4. 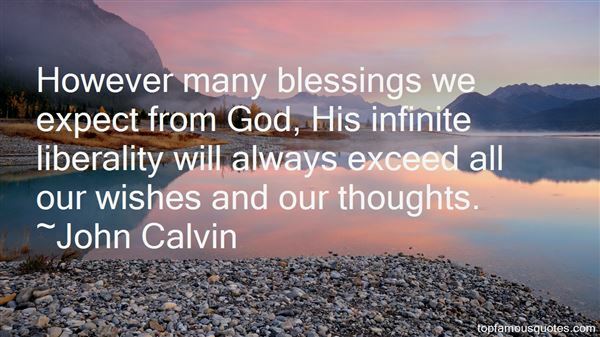 "However many blessings we expect from God, His infinite liberality will always exceed all our wishes and our thoughts." 5. 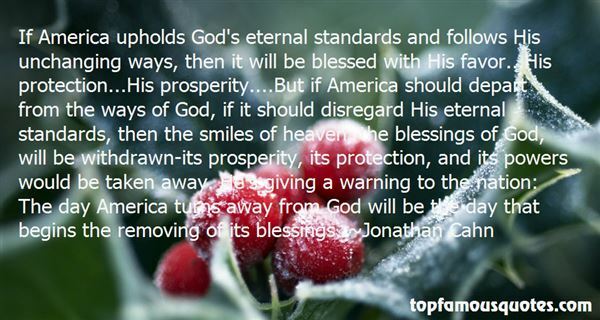 "If America upholds God's eternal standards and follows His unchanging ways, then it will be blessed with His favor...His protection...His prosperity....But if America should depart from the ways of God, if it should disregard His eternal standards, then the smiles of heaven, the blessings of God, will be withdrawn-its prosperity, its protection, and its powers would be taken away. He's giving a warning to the nation: The day America turns away from God will be the day that begins the removing of its blessings." 6. "I DECLARE Unexpected Blessings are coming my way. I will move forward from barely making it to having more than enough. God will open up supernatural doors for me. He will speak to the right people about me. I will see Ephesians 3:20, exceedingly, abundantly, above and beyond favor and increase in my life. This is My Declaration." 7. "God pours out his choicest blessings on those who are anxious that nothing shall stick to their hands. Individuals who value the rainy day above the present agony of the world will get no blessing from God." Come and show me another city with lifted head singing so proud to be alive and coarse and strong and cunning...proud to be Hog Butcher, Tool Maker, Stacker of Wheat, Player withRailroads and Freight Handler to the Nation."